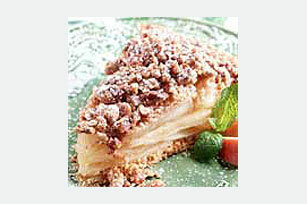 Do not let its nutty golden-brown crumble topping fool you, our Easy Apple Crumble Pie is so simple to make. It's quick quick, too—Easy Apple Crumble Pie is ready for the oven in just 10 minutes! Preheat oven to 375°F. Brush pie crust lightly with some of the egg white. Bake 5 minutes; cool. Spoon pie filling into crust. Mix flour, granulated sugar and cinnamon in medium bowl. Cut in butter until mixture resembles coarse crumbs; stir in pecans. Sprinkle over pie filling. Bake 25 to 30 minutes or until topping is golden brown. Cool slightly on wire rack. Sprinkle with powdered sugar. Enjoy a serving of this easy-to-make dessert on occasion. Garnish with apple slices and mint leaves just before serving.